The region’s electrical grid has not kept pace with advances in energy technology and will require greater investment and coordination among energy providers and regulators across the three states to become a lower-emitting, reliable, and flexible system. Long-term planning for electricity demand should be focused in the region through a Tri-State Energy Policy Task Force. With a clearer sense of demand and a cohesive approach to incorporating emerging renewables such as wind and solar and storage technology, the grid can be updated to become more intelligent, with two-way communications, integration of distributed generation, and greater use of products that help consumers manage their energy use. As cleaner fuels generate more power, existing electricity-supply facilities—including fast-ramping plants necessary for rapid changes—can be updated and used more effectively. The system of power generators and transmission and distribution infrastructure that comprises the grid supports our economy and, indeed, our entire society. But despite significant innovations in energy science and technology over the last few decades, our grid has not kept pace. Built to convey power in one direction from large, centralized plants burning fossil fuels, the grid is not properly equipped to integrate new and intermittent, renewable supply, small-scale distributed resources. The grid is also not prepared for smart homes, buildings, and devices, or to meet the demand for additional electrification of all sectors of the economy. The vast majority of ratepayers know little about their energy, and thus have few reasons to change their behavior and become more efficient. Responsibility for modernizing the grid is divided among private utilities and regulators located within a complex network of regional transmission organizations and independent system operators, each with their own guidelines and territorial responsibilities. Energy suppliers and local governments, with their authority over siting and land use, also have a stake in how the grid is transformed. Without significant changes to regulatory structures and policies, and without substantial new investment, our region will remain bound to a grid that pollutes and warms the planet, misses opportunities to innovate, and fails to meet growing demand. 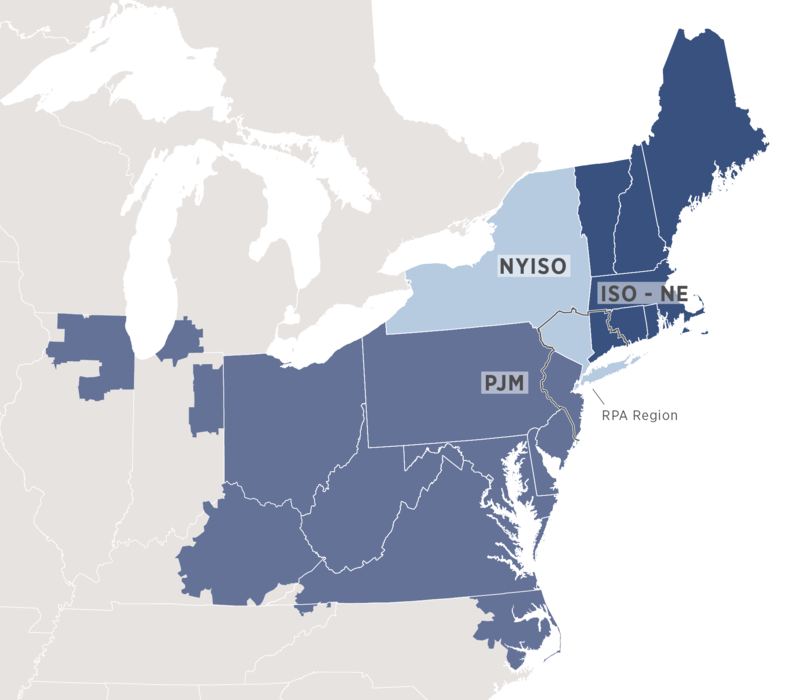 The tri-state region is divided between three different transmission planning entities: the PJM Interconnection, the Independent System Operator - New England, and the New York Independent System Operator. These federally regulated, non-profit corporations coordinate transmission and ensure the safety and reliability of the electric system within each of their geographic purview, but don’t collaborate between them. A Tri-State Energy Policy Task Force would bring together these entities, along with other stakeholders, to promote coordinated networks to support new energy technologies. With an expected increase of as four million people and two million jobs in the region over the next 25 years, more electricity will be needed. And as buildings and vehicles move toward greater electrification, that demand will grow even more. Unfortunately, too little transportation and land-use planning takes energy consumption into consideration. And if we continue down our current path, greater demand will be met through the burning of fossil fuels rather than by renewable energy. A regional task force bringing together regulators, public officials, utility executives, generators, and other stakeholders and advocates could plan more effectively for the future of energy production. The Task Force should assess jurisdictional barriers to renewable energy and grid modernization, and foster the development of a comprehensive, regional assessment of future electricity demand. The effort would require cooperation among entities that rarely interact, including the metropolitan planning organizations, state transportation and planning divisions, Regional Transmission Operators/Independent System Operators (RTO/ISO), and utilities. The Task Force should be guided by the competitive market designs and principles that govern the wholesale markets in each of the RTO/ISO jurisdictions, which seek to maximize the use of market forces to produce the lowest-cost outcomes and shield electricity consumers from the cost of bad investments and poor performance. This group should be established at the direction of the states’ governors and consider, among other things, new technologies such as offshore wind, energy storage, alternative-fuel vehicles, and the potential implementation of coordinated networks to support these new technologies in response to market needs. Pricing is an effective strategy to influence consumers’ demand for energy. Customers respond to energy rates that vary based on the time of day and season, especially critical peak pricing. Service providers in our region offer optional time-of-use rate plans, but few customers have signed up for them. California already offers customers who use distributed solar power a time-of-use rate—which will become the default rate for all customers in 2019. Energy regulators in the region should require all customers be transitioned to time-of-use rate plans. As the grid becomes “smart,” users will know in real time how much power they are consuming and what the overall demand on the grid is—perhaps even predicting power spikes. Smart home systems could adjust accordingly, taking actions to delay usage or turning off non-essential appliances—some of these systems are, in fact, already available. Utility companies should accelerate the widespread adoption of smart devices connected to the grid by promoting, or even incentivizing, their purchase. Peak time for energy production from renewables does not always align with peak demand. Solar panels produce maximum energy in the afternoon, for example, but peak demand for electricity typically occurs in the evening. The timing and “shape” of electricity use throughout the day will continue to change as a result of more efficient and smarter end-use devices, consumer behavioral changes, and the increased electrification of transportation and space-heating applications. Storing the power created for later use is critical to the widespread adoption of renewable energy, and the federal government and states need to further invest into R&D of new and cost-effective storage technologies. At the regulatory level, states in the region’s three different transmission planning entities (ISO-NE, NYISO, and PJM) should initiate market rule changes to facilitate the participation and full valuation of energy storage in their wholesale markets, and support the commercial deployment of energy storage as an integral part of a flexible, sustainable, low-carbon grid. A modern and efficient energy grid has diversified sources of power and the ability to cycle energy into and out of the grid. Renewables should make up at least 50 percent of our region’s electricity generation over the coming decades. But because sources such as solar and wind can be highly variable, other sources will be needed until advances in storage are made. Existing nuclear power can also play an important role in a low-carbon energy system, providing a steady and inexpensive base load of power without emitting greenhouse gases. Nuclear power plants that pose the greatest safety risks, such as Indian Point, should be closed, while others should continue to operate, provided they meet the most stringent safety and operating standards. Natural gas has allowed the region to shift away from the dirtiest sources of fuel, including coal and oil, and will continue to play an important role for the near term. The need for fast-ramping “peaker plants” will also remain for the foreseeable future, but their use and footprint should decline over time. As the rest of the electrical system modernizes and transforms, existing peaker plants in the metropolitan area should be modernized and, where possible, reduced in size to meet the highest standards of flexible performance and emissions control, while opening up the potential for new land uses around them. The electrical grid has traditionally been considered a “one-way” network to transport energy from large-scale centralized power plants, through wires for ultimate delivery to electricity consumers. More recently, with the improved technology and economics of small-scale power production such as rooftop solar panels, microgrids, and other technologies, distributed generation has been gaining traction, paving the way for a more intelligent “two-way” grid. Distributed generation allows consumers to generate power onsite for direct consumption, and for small-scale grid-connected generation sources to support grid operations more cost-effectively than traditional “wired” solutions. Increasingly, distributed-resource owners, utilities, and regional grid operators are establishing effective mechanisms for selling excess power to the utilities or other customers through the wholesale markets. This, as well as advances in metering and communications technologies, is enabling utilities and regional grid operators to be more comfortable with distributed generation as part of their reliability planning and operations. The increased deployment of distributed generation could lead to greater resiliency, reliability, and flexibility, with reduced demand and load on the grid. States should help accelerate and leverage these trends to create a robust grid that integrates significant amounts of distributed generation, supports the ability for two-way power flows, and has open and flexible communication channels between utility companies, regional grid operators, and electricity consumers. New technologies for sensing system conditions at more points on the transmission and distribution system, improved communications, data-processing capabilities to capture and organize the data, and more interactive consumers and devices will create opportunities for better management of the grid by the utility and regional grid operator. It will also enable more engagement by consumers and their devices to balance the system moment by moment. New York’s Reforming the Energy Vision (REV) plan is a model for the region in advancing this more intelligent and flexible grid. Similar approaches should be taken in New Jersey and Connecticut. A 21st century grid would lead to a cleaner and more reliable energy system. As older power plants are used less and ultimately retire, air pollution will decrease, improving the quality of life for all residents, including those burdened by their location. Fewer greenhouse gases would be emitted, slowing and/or minimizing the consequences of climate change. The grid itself would become a more democratized system, allowing for increased knowledge and participation by users in decision-making around energy. Innovative technologies would find more equal footing with traditional energy technology, allowing the opportunity for increased economic development. New green jobs could be created. And finally, a comprehensive energy vision would help both residents and energy suppliers determine where investments are needed for the future. Many of the improvements discussed above will require considerable public and private investment into new technologies and added infrastructure. Some of these costs—particularly those that align with relevant criteria—could be covered by the proceeds generated from an expanded greenhouse gas market. Other measures will require private investments, which should rely primarily on the wholesale competitive markets and potential distribution markets, such as those advanced by New York’s REV plan. In other cases, such private investment may need to be helped along by public incentives. Connecticut’s and New York’s Green Banks maximize public funds by working with private sector investors to create low-cost, sustainable financing for clean-energy investments. Infrastructure to facilitate expanded customer and investor engagement in the distributed grid may best be supported by investment from utilities backed by ratepayers, who will ultimately pay more stable and even lower rates as a result of expanded choices and greater system efficiencies.